Social media can have a huge impact on lead generation companies. It is a relatively new way to generate leads quickly and effectively using online media marketing. 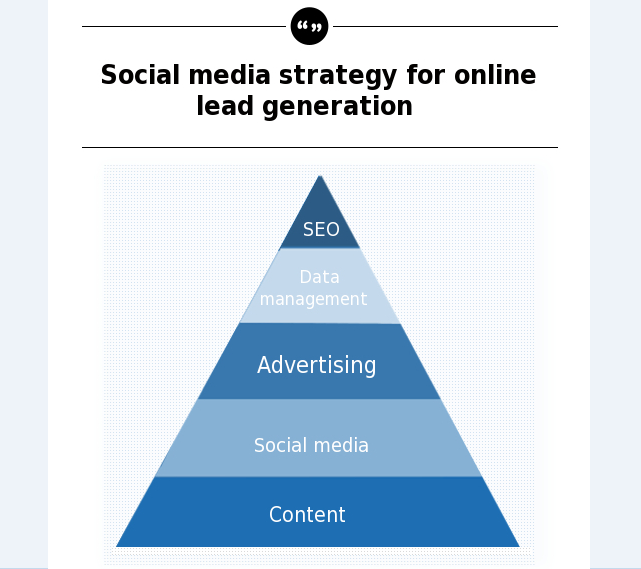 Twitter, Facebook, Linked in, Google+ are the most common tools for social media lead generation. Facebook is the largest social media network in the world and the number of visitors is growing, Facebook now has 1.11 billion people. Social media indicators such as the number of likes, followers, tweets and shares can measure current trends between users. Online advertising with social media can bring new visitors to your sites and this means new leads for you to sell. The best social media strategy to generate leads efficiently is based on content, which has the biggest impact on driving traffic to your web sites. Regardless of your business or industry, knowing what your customers need and then providing valuable and relevant content, such as statistics, industry-specific information and research, will increase the number of leads you generate. boberdoo.com produces lead distribution system that allow you to track, manage, route and bill leads based on custom business rules you determine. Contact us today for a live demo to see how boberdoo can help your business. There are enough things to worry about in lead generation, your distribution system should not be one of them. To learn more about "Importance of Search and Social Media in Lead Generation", please click on the Contact Us tab or call 800-776-5646.